After the success of YourTube and having time on our hands whilst our broken city of Christchurch begins to recover from a devastating earthquake, we at Povidi decided to prove that Google applications can be made easy to use for the blind and visually impaired. We are pleased to announce after 3 weeks of effort the first offering, My Accessible Google Calendar a simple way to use Google's Calendar service. So now you too can add appointments, review what you have planned for a day, week, month or any time period in a simple and effective manner. Feel free to check it out and we hope you find this simple service as useful as we do. Povidi is proud to have been involved in developing a highly accessible series of web pages that allows quick and easy access to YourTube videos. Search choose and play in 3 easy steps. Dylan Neale and Povidi have worked together to offer this free service to make it just that little bit easier to access the incredible range of material now available on YouTube. Click here to visit the YourTube pages. As many of you may know Christchurch has been hit by a devastating earthquake and we are able to say we are all safe and well. However the centre of our city has been badly affected and the SoundPost installation is currently unavailable as many of the buildings where they are placed are either damaged or still within the "red zone", which is cordoned off and not accessible to the general public. We will keep you informed of the status of the Precinct at the appropriate time. We have had the opportunity to observe some places where the Soundposts are placed, and despite half the building being down, the SoundPosts are still up and pointing in the right direction! Please consider helping us to rebuild our city by providing a donation to the New Zealand Red Cross by clicking on this link<. It would be greatly appreciated. 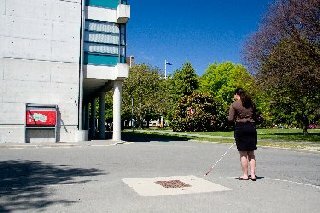 Povidi is proud to announce the SoundPost Orientation System, a simple affordable solution that allows for the first time, a blind citizen to cross up to 30 metres of open space. Straight across the car-park out front to the entrance, across the foyer to the information counter, or maybe the ability to identify a specific building along the street, the possibilities are endless and the benefits speak for themselves. 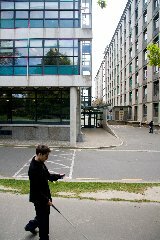 Made up of a hand controller carried by the blind person themselves, and strategically placed base stations put up at important places, such as at the entrance to a public building, the SoundPost Orientation System allows for the first time true independent accessibility to public arenas. Talking GPS systems aid in navigating and getting to public space, and the white cane or guide dog helps in avoiding obstacles but where is the door, someone who can help out, the rest rooms, the ticket counter, the escalators, elevators? Now there is a solution. Full details can be found on the SoundPost product page, or check out the video which shows the SoundPost in action. On October 15 Povidi will be formally launching the SoundPost Orientation System, with an urban installation through the Cultural Precinct in Christchurch, New Zealand. At the same time this web site will begin offering the product for general sale. Please check back again at that time if you are interested in being one of the first to own this exciting new product that really makes those difficult open spaces easy to cross. A fulle description of the Cultural Precinct installation can be found here, and all base station locations noted here.